As February is the shortest month, we picked a fairly brief (only 150 pages) novel for this month’s Reading and Refreshments: John Buchan’s classic spy thriller, The Thirty-Nine Steps, which relates the tale of an averted German invasion just before the outbreak of World War I. And what excitement Buchan packed into those 150 pages! I think it is safe to say that this is the most spine-tingling page-turner we’ve featured so far. I got a detonator, and fixed it to a couple of feet of fuse. Then I took a quarter of lentonite brick, and buried it near the door below one of the sacks in a crack of the floor, fixing the detonator in it. For all I knew half those boxes might be dynamite . . . In that case there would be a glorious skyward journey for me and the German servants and about an acre of the surrounding country . . . The odds were horrible, but I had to take them. I ensconced myself just below the sill of the window, and lit the fuse. Then I waited for a moment or two. There was dead silence–only a shuffle of heavy boots in the passage, and the peaceful cluck of hens from the warm out-of-doors. I commended my soul to my Maker, and wondered where I would be in five seconds . . . But it’s not all empty thrills and cut-throat adventure, as we get to see the character of the narrator, Richard Hannay, develop from a dissatisfied London resident, recently returned from the mining fields of South Africa, to a resourceful, daring man-on-the run. He finds that London is not so dull after all, as his apartment serves as a refuge to a mysterious gentleman named Scudder, fleeing from the undercover organization, the Black Stone. He tells Hannay of their attempt to sabotage the relationships of various European nations, and his determination to foil their efforts to plunge the world into war. The jaded Hannay, however, is only mildly interested. I did not give him very close attention. The fact is, I was more interested in his own adventures than in his high politics. I reckoned that Karolides and his affairs were not my business, leaving all that to [Scudder]. So a lot that he said slipped clean out of my memory. But all this changes in a moment, when Hannay returns to the apartment one night to find Scudder murdered and himself next on the Black Stone’s wanted list. The fact that the British police believe he murdered Scudder doesn’t help . . .
Hannay flees to the wilds of Scotland, where he attempts to stay out of the clutches of both the Black Stone and the police until June 15th, the day fixed for the great attempt. He deciphers Scudder’s notebook, learning, to his horror, that the Black Stone’s plan is far more serious than just merely upsetting diplomatic good-will.
. . . in June, a very great swell was coming over from Paris, and he was going to get nothing less than a statement of the disposition of the British Home Fleet on mobilisation. At least I gathered it was something like that; anyhow, it was something uncommonly important. But on the 15th day of June there were to be others in London . . . They represented not our Allies, but our deadly foes; and the information, destined for France, was to be diverted to their pockets. And it was to be used, remember–used a week or two later, with great guns and swift torpedoes, suddenly in the darkness of a summer night. I swung through little old thatched villages, and over peaceful lowland streams, and past gardens blazing with hawthorn and yellow laburnum The land was so deep in peace that I could scarcely believe that somewhere behind me were those who sought my life; ay, and that in a month’s time, unless I had the almightiest of luck, these round country faces would be pinched and staring, and men would be lying dead in English fields. There was something about the old gentleman which puzzled and rather terrified me. He had been too easy and ready, almost as if he had expected me. And his eyes had been horribly intelligent . . . There was something weird and devilish in those eyes, cold, malignant, unearthly and most hellishly clever. They fascinated me like the bright eyes of a snake. I had a strong impulse to throw myself on his mercy and offer to join his side, and if you consider the way I felt about the whole thing you will see that that impulse must have been purely physical, the weakness of a brain mesmerised and mastered by a stronger spirit. But I won’t tell you any more, I don’t want to spoil the fun! Just please, do yourself and the rest of your family a favour and read it. For your treat make some traditional Scottish scones, baked on a griddle rather than in an oven, just like the ones the country woman probably served to Hannay on his first night in Scotland. When I asked for a night’s lodging, she said I was welcome to a ‘bed in the loft,’ and very soon she set before me a hearty meal of ham and eggs, scones, and thick sweet milk. And remember, if you decide to hold your own “Reading and Refreshments,” please let us hear about it! Tell us how your family enjoyed the book and whether or not you made the treat to go with it. If you can, send us a photograph as well. You can contact us at thesiblingwritery@hotmail.com. “Girdle” is the Scotch variation of griddle. These scones are not baked in the oven, but on a heavy griddle on the stovetop. This cooking method produces a scone that is crisp and golden on the top and bottom, but lovely and creamy on the inside. Over low heat on the stovetop, start to preheat a heavy pan or griddle. In a large bowl, sift together the flour, cream of tartar, and baking soda. Using your fingertips, rub the cubes of butter into the dry ingredients until large, cornflake-sized pieces remain. Stir in the raisins and sugar. Add enough of the milk to form a soft dough. If you need a little more milk than the ½ cup indicated, please do not be afraid to splash in a bit more. The amount you need really depends on how dry your brand of flour is, so don’t worry if you don’t use it all up, or if you have to add in extra. Turn the dough out onto a lighty floured counter, and roll out into a ½-inch thick circle. Cut into rounds with a 2 ½-inch cutter. You should get nine scones. By now your griddle (or pan) should be nice and hot, so drop on a small piece of butter and rub it around the griddle to grease the entire cooking surface. 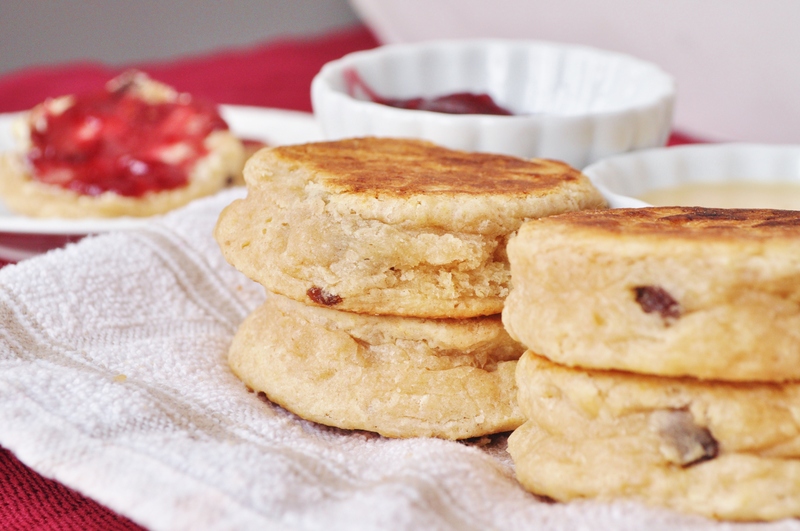 Place the scones on the griddle and turn down the heat to the lowest possible setting. This way the scones will cook all the way through without browning too much on the outside. Cook the scones until they are a rich brown on the bottom, 8 to 10 minutes. Use a spatula to flip them over and continue to cook on the other side until the scones are no longer doughy in the centre, another 10 to 15 minutes. Rotate the scones on the griddle as they cook, as certain parts of the griddle may be hotter than others. 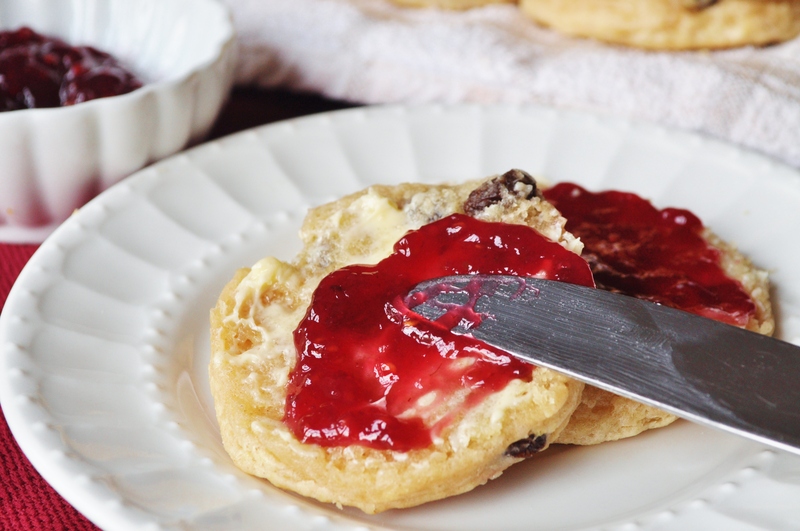 If you rotate the scones as they cook, you should be able to avoid uneven colouring. Remove from the griddle to a platter and let cool for a few minutes before serving. I suggest eating these warm, with loads of butter and your nicest jam. Not the sort of book I’d usually choose for myself but I enjoyed your synopsis. Copyright © The Sibling Writery 2016. All rights reserved.